Traditional Spanish churros and chocolate. $5 Delivery. No Minimum Spend. Get San Churro delivered to your door! 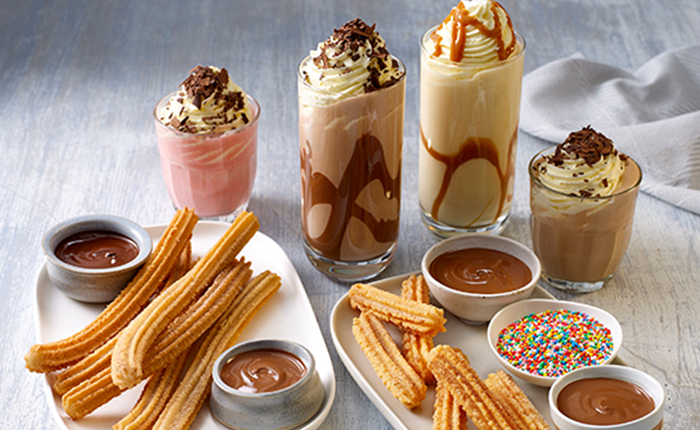 Chocolate lovers unite and find your local San Churro pronto. Here you will find your tribe, all on a pilgrimage to worship at the shrine of the dark brown block of sweet goodness: chocolate. Inspired by the Spanish ritual of gathering, sharing and indulging in the joy of chocolate, San Churro Chocolaterias are brimming with young people (and the young at heart), who all have one thing in common: a sweet, sweet love. Churros (Spanish doughnuts) are cooked fresh to order, dusted with cinnamon sugar and served with Spanish imported chocolate and other sweet delights. Decadent desserts, premium chocolate shakes and traditional Spanish hot chocolates are also on offer; as well as a host of vegan and low gluten options. San Churro is also home to the latest chocolate discovery in 80 years: Ruby chocolate – naturally pink and fruity, it is a delight to experience. And the coffee? It is a signature Fairtrade blend, designed to pair perfectly with chocolate and lovingly brewed by professionally trained baristas. There is a lot to love at San Churro. So make like a Spaniard, grab your main squeeze or your bestie, and settle in for a chocolate fiesta. San Churro are seriously serious about their chocolate. Named for the Spanish monk, San Churro -- who believed in the healing powers of chocolate, and was ultimately responsible for introducing the sweet treat to the masses -- this delightful restaurant is a failsafe option no matter who you're ordering for, or what sweet thing you're craving. In the milkshake arena, we're partial to the White Choco Loco, featuring white Spanish chocolate and ice cream, and the Cookies and Cream (chocolate fudge, choc cookies and ice cream) is a guaranteed hit with the kiddies. Obviously the Ice Cream menu is off the chain, but we'd be remiss not to call out the San Churro Choc, which comes in an actual bowl made of churro filled with all the chocolatey-ice-cream-goodness you can imagine. Log onto the Menulog app or website and within a few taps your decedent, envy-inducing dessert could be delivered right to your doorstep!